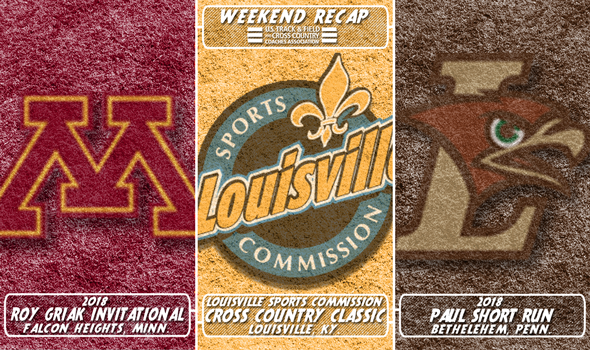 A busy weekend of collegiate cross country continued Saturday with several longtime meets being held across the nation, in particularly the Louisville Cross Country Classic (formerly known as the Greater Louisville Classic) in Louisville, Kentucky, the Paul Short Run in Bethelehem, Pennsylvania, and the Roy Griak Invitational in Falcon Heights, Minnesota. Here are a few quick hits from each of those meets in alphabetical order. North Central (Ill.) isn’t afraid of a little competition. In fact, the Cardinals – who are the top-ranked team in the NCAA Division III Men’s National Coaches’ Poll – flock to it. North Central (Ill.) beat everybody in the Men’s 8K Gold Race as it won the team title with a score of 102 points, eight fewer than NCAA Division I Kentucky. The Cardinals topped several NCAA Division I programs, including those aforementioned Wildcats, Belmont and Louisville. Dhruvil Patel led North Central (Ill.) with a fourth-place finish and the rest of its scoring lineup finished inside the top-35. Michigan’s women rolled to the team title in the Women’s 5K Gold Race. The Wolverines, who were ranked 10th in the most recent NCAA Division I Women’s National Coaches’ Poll, scored just 46 points as all seven of their runners finished in the top-25 – including three in the top-10 right next to each other (Avery Evenson in fifth, Hannah Meier in seventh and Camille Davre in eighth). Eastern Kentucky, which was ranked eighth in the Southeast Region in the most recent NCAA DI Regional Rankings, finished a distant runner-up to the Wolverines. Utah State edged Virginia Tech for the team title in the Gold Men’s 8K Race. The Aggies scored 77 points compared to the Hokies’ 80. Even though Virginia Tech put four in the top-10 (1-8-9-10), led by individual champion Peter Seufer (24:11), Utah State’s pack running (3-6-18-23-27) proved to be too strong as it also posted a 1-5 spread of 23 seconds. Army West Point finished third as a team despite no runners in the top-10 individually. Haverford and Carnegie Mellon finished as the top non-NCAA DI programs in the race in 10th and 11th place, respectively. Yale earned the team title in the Gold Women’s 8K Race over Georgia and Utah State, among others. The Bulldogs of the Ivy League didn’t receive a vote in the most recent National Coaches’ Poll, but should be due for a bump this coming Tuesday. Johns Hopkins, the No. 1 team in the NCAA Division III Women’s National Coaches’ Poll, finished ninth as a team as it posted a miniscule 1-5 spread of 40 seconds. Harvard, led by individual champion Kieran Tuntivate, made a run at the team title in the Merrill Fischbein Men’s Gold race, but in the end it was Duke and Minnesota who battled it out for the crown. The Blue Devils held off the host Golden Gophers by a score of 74-77 (The Crimson finished third). Duke’s third and fourth runners proved to be the deciding factor as it trailed Minnesota 14-17 through two, then swung ahead 28-32 after three and extended it to 47-53 with one more to cross the finish line. Minnesota won its first team title in the Jack Johnson Women’s Gold race since 2008 thanks to the 1-2 finish of twin sisters Bethany Hasz and Megan Hasz. Bethany Hasz is the first female Golden Gopher to win the individual title since Megan Duwell in 2009. Minnesota put its entire lineup – all seven runners – in the top-25 and scored 52 points to Cal Baptist’s 82. Stanford romped to the team title in the Men’s 8K College Open. The Cardinal, which was ranked fourth in the most recent NCAA Division I Men’s National Coaches’ Poll, put its entire scoring lineup in the top-8. Alek Parsons was the top finishing athlete for Stanford in third overall. UCLA finished a distant second and Adams State, the No. 1 team in the NCAA Division II Men’s National Coaches’ Poll, took third place behind a runner-up individual effort by Sydney Gidabuday. Stanford also captured the team title in the Women’s 8K College Open, but it wasn’t a forgone conclusion. The Cardinal had to work for it as Adams State, the top-ranked team in the NCAA Division II Women’s National Coaches’ Poll, was with the host each step of the way. Through three runners, Stanford had 10 points (1-3-6) to the Grizzlies’ 28 (4-9-15), but Damon Martin’s squad fought back with their next two runners in 16th and 25th place, compared to the Cardinal’s 21st and 31st place. When the dust settled, Stanford held on for the 62-69 victory. The Cardinal received the lowest of low sticks from Elise Cranny, who returned to her winning ways.